All staff at Tamworth Castle are happy to help - please feel free to ask if you have any special requirements, either ahead of your visit or when you arrive. Parking: all Tamworth Borough Council car parks are free to Blue Badge holders. Silver Street, running alongside the Castle, is specifically for Blue Badge holders only. Please note there are limited spaces available here. Take a look at car parking near the Castle. There is a drop off point for people with disabilities at the foot of the slope. We kindly request after the drop off the vehicle is moved to a car park (this area must be clear for emergency vehicles). Entrance: The Castle Keep is situated on a man-made 11th century mound and entry to the Castle is reached via a steep slope. Visitors with disabilities are admitted at the standard rate but an accompanying carer, personal assistant or a companion is given free entry if they can provide appropriate proof of care including registration letter, DWP letter or similar. Please notify the admissions staff when purchasing your tickets. Guide, assistance or service dogs are all welcome. Dogs: Dogs are not permitted into the castle building but guide, assistance or service dogs are all welcome. All dogs are permitted in the castle grounds. Tour: Tamworth Castle is an historic building which has been standing for more than 900 years and it does have many uneven surfaces and stairs. The interior tour includes a lot of steps and narrow doorways. There are places to sit inside the building - either benches, chairs or window seats. Access for people using wheelchairs or pushchairs: This is possible to the whole of the ground floor and includes the medieval courtyard, dungeon, The armoury, Great Hall and shop. 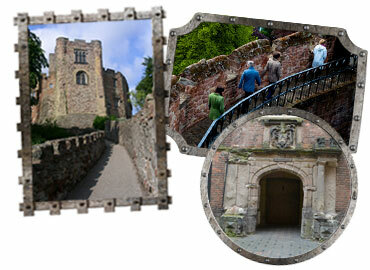 The Great Hall features a virtual tour of the Castle and photographic collection of images of Tamworth town. A manual wheelchair is available for use within the Castle which is available on a first come, first served basis and cannot be booked in advance. Please ask a member of staff for assistance.